community needs. When youth are involved in selecting and planning such efforts, and have structured time to reflect, talk, and write about the actual service activity they are performing the youth learn more, they become more confident about what they have learned, they improve in problem-solving ability, their leadership and social abilities improve, they take more enjoyment in the overall learning experience, they retain the subject matter longer, and they are more likely to volunteer to serve the community in the future. Community Service Learning can be performed individually, or as a group of varying sizes. (Source: CSREES-Beyond 4-H Community Service, 1997). 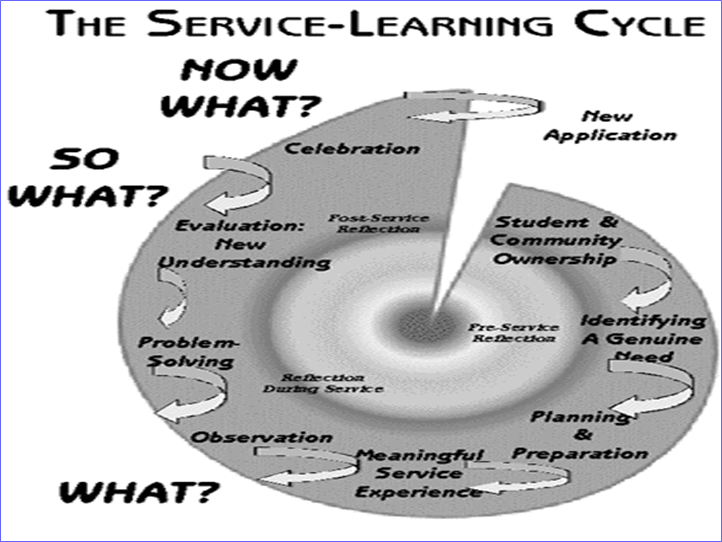 The first step in the Service Learning process “Why am I doing this?” or “Why am I learning this?” came into focus for all of these students. In Avoyelles, the “Why” is because the school system they are part of has a weakness in literacy across the parish. So these 4-H leaders decided to gain a deeper understanding of their community and the issue of low literacy rates and decided to focus on putting books into the hands of little ones. In Allen, the “Why” is because the 4-H Junior Leader club is part of a community where cancer rates are higher than most areas of the state. Maybe it’s because of the Gulf Coast refineries, the watershed, their diet, the pollution from Gulf Coast industry. The youth are learning about the risks found in their environment and how individuals can make an impact. These discussions lead to responsibility and actions that citizens can take to insure a safer and cleaner climate.